A magistrate who posted a picture of himself holding an AK-47 rifle on Twitter has been suspended while an investigation takes place. 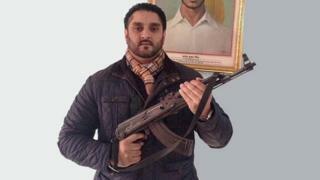 Derby city councillor Ajit Atwal has apologised for the photograph, which was taken on holiday in India. Council leader Paul Bayliss, complained about Liberal Democrat Mr Atwal to the Derbyshire Advisory Committee on Justices of the Peace. Mr Atwal has refused to comment on his suspension. In its written response to Mr Bayliss's complaint, seen by the BBC, the committee said: "This magistrate will not be sitting in court until the committee has concluded their investigation." Labour's Mr Bayliss made calls for Mr Atwal to resign as a councillor when the photo appeared in a national newspaper last month. Mr Atwal apologised for the photograph, posted on Twitter eight months ago, but refused to resign, saying he had "done nothing wrong". The picture was removed from his profile after it appeared in The Sun. Derbyshire Police had been investigating if an offence had been committed but a spokesman confirmed that they will not be taking any action. The Liberal Democrats group in Derby launched its own investigation into the matter after the picture came to light. A party spokesman has said that no further action will be taken against Mr Atwal.